Look, I know that selling you on video game development post mortems is a tricky thing, so I'm attempting to wow you with "What If?" 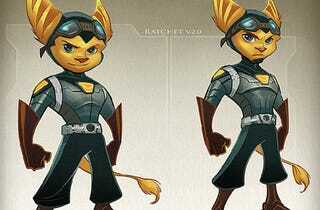 concept artwork from Ratchet & Clank Future. But read on! John Fiorito, chief operating officer at Insomniac Games, wrote about the trials, tribulations and successes the developer experienced during the production of Ratchet & Clank Future: Tools of Destruction, its second PlayStation 3 game. For example, Fiorito pulls back the curtain on Insomniac's trailer for Ratchet & Clank Future, known as "Metropolis," writing that it was built "frame by frame" in the Resistance: Fall of Man engine, essentially a "target render." On top of that, Fiorito provides exciting data for you to crunch on, including that Ratchet & Clank Future comprised 980,184 lines of code and used up a terabyte of hard drive space over at Insomniac HQ. Believe it or not, there are challenges developing two games concurrently on non-finalized, new-gen hardware. Read all about it at Gamasutra.